Question - What do you mean by product life cycle? Explain the major stages of product life cycle. We have a life cycle, we are born, we grow, we mature, and finally we pass away. Similarly, products also have life cycle, from their introduction to decline they progresses through a sequence of stages. 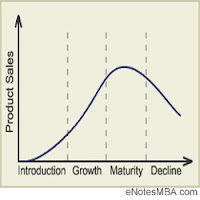 The major stages of the product life cycle are - introduction, growth, maturity, and decline. Product life cycle describes transition of a product from its development to decline. The time period of product life cycle and the length of each stage varies from product to product. Life cycle of one product can be over in few months, and of another product may last for many years. One product reach to maturity in years and another can reach it in few months. One product stay at the maturity for years and another just for few months. Hence, it is true to say that length of each stage varies from product to product. Product life cycle is associated with variation in the marketing situation, level of competition, product demand, consumer understanding, etc., thus marketing managers have to change the marketing strategy and the marketing mix accordingly. Product life cycle can be defined as "the change in sales volume of a specific product offered by an organisation, over the expected life of the product." The promotion is informative and personalised. The promotion is focused on brand development and product image formation. The promotion is focused on repeat purchasing. The promotion is focused on reminding. I like the notes, they have been explined so nicely, and they are very understandable. This note is in very simple language.